Easy to install invisible fence. This pet containment system is approved by vets. It is a radio fence not an electric fence. Not just a dog fence, cats and other animals too. 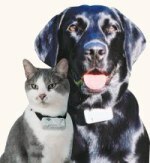 Petsafe Professional stress free training. Our Freedom Fence is completely legal and exempt from the UK Government e-collar ban. Freedom Fence is the longest established company in the UK to offer full installation and training. Effective for any number of pets on the system. Pets are free to run - but not run away. Astonishingly inexpensive compared with traditional fencing. Qualified Lite Touch training advisors to assist with our easy, humane training programme. Can keep pets out of 'No-go' areas. First class pre and post sales service. Professional installer consultation with no charge and no obligation. Approved and used by vets. 100% safe - no electricity is carried along the wire. This is not an electric fence. Great to look at as it is invisible. Not just dogs, it's a pet fence and cat fence. Freedom Fence allows your pets to enjoy the full run of your garden and grounds all day, whether you are with them or not and thus hugely improve the quality of their lives. The Freedom Fence pet containment system is a radio fence and not an electric fencing system. Ownership of pets can be a source of worry as well as joy. If you are not worried about having been away for too long without having let them out for a run, you are worried about them bothering the neighbours, straying and getting lost, or being involved in an accident. You can eliminate all these sources of stress, very simply, by installing a Freedom Fence. We all try to keep on good terms with our neighbours but our pets can sometimes make this rather difficult. If you have this problem, harmony can easily - and permanently - be restored by installing a Freedom Fence. Freedom from stray pets on the roads. Modern roads are dangerous enough without the additional hazard of stray pets, and the nightmare scenario is that your pet could cause an accident in which someone could be killed. Responsible pet ownership now means that we have to keep our pets secure - and the best way to achieve this is to install a Freedom Fence.